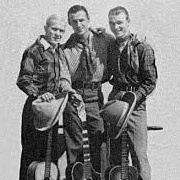 The Sons of the Pioneers, formed in 1934, is known as the original “singing cowboy” band instrumental in creating the earliest sounds of western music. Founded by Roy Rogers (then known as Leonard Slye), Bob Nolan and Time Spencer the band has remained together continuously since then, rotating a total of 46 members over the years. These five talent-infused musicians (including Roy Roger's son) continue to add a new level of energy to this classic genre, taking audiences time-traveling into the great American west with them. Who are the Sons of the Pioneers and how can they claim to be “Legends of Western Music”? The short answer is that the Sons of the Pioneers singularly built a new genre and library of music that is an American original, one that has become synonymous with the American West, and that continues to enthrall generations of listeners worldwide. Although others have followed, although others have openly emulated them and have subsequently added to the genre of Western music, the Pioneers were the first and the best. They are an essential part of Americana. What would the West be without its own style of music? When you think of the West you think of natural beauty, a cultural mind-set and a very distinctive type of music. The term evokes the image of the singing cowboy and of songs that paint vivid mental pictures of tumbling tumbleweeds, cool water, tall timber and that ornery strawberry roan. The West has always had its lore and its heroes, but until the 1930s a distinct type of music was not part of that lore. Starting in the early 1930s the film and radio industry changed all that forever. From the earliest days of the film industry the cowboy has been a favorite movie subject. Westerns became the bread and butter of most early studios. When musical segments were added to broaden a movie’s interest the “singing cowboy” was born, and it created mega stardom for people like Gene Autry, Roy Rogers, Tex Ritter and Rex Allen. Enter the Sons of the Pioneers in 1934. The Pioneers were different right from the start. While most Western screen stars were singing traditional sweetheart songs, the Sons of the Pioneers sang about the West itself. Their songs painted unforgettable images and stories of horses, cattle, cowboys, night herds, canyons and prairies. Many of these songs were original compositions freshly penned by founding members Bob Nolan and Tim Spencer. Together with Roy Rogers (then known as Leonard Sly) they created a whole new library of music. The group and their music garnered millions of national and international fans through appearances in over 90 movies, numerous radio shows, major label recording projects and later television appearances. 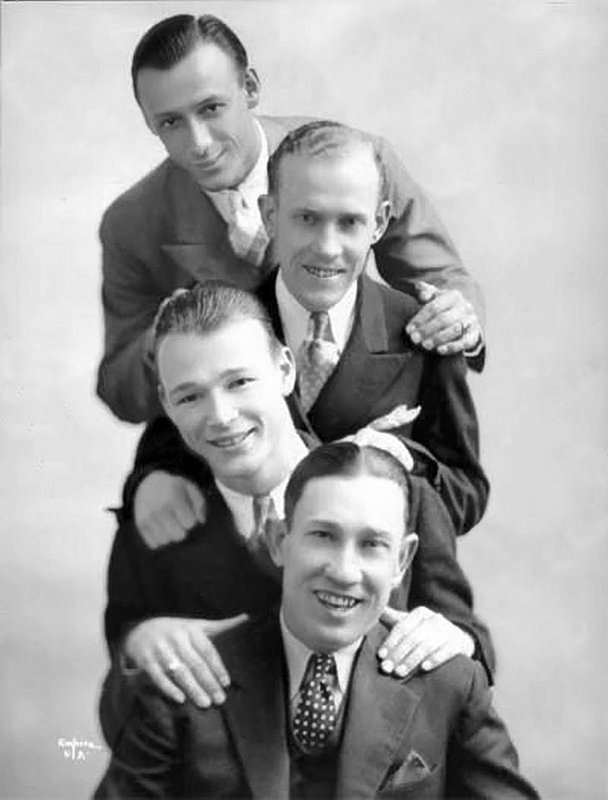 Songs from the Pioneer catalog have been recorded and used by a long list of who’s who in the music industry that includes Bing Crosby, the Boston Pops, Dina Ross and the Supremes, Frankie Laine, Johnny Cash, Riders in the Sky, Michael Martin Murphy, the Muppets. The Coen brothers featured “Tumbling Tumbleweeds” in their classic movie “The Big Lebowski.” Their signature songs have been recorded so many times by so many different artists that some people lose track of the fact these songs “belong to” the Pioneers. 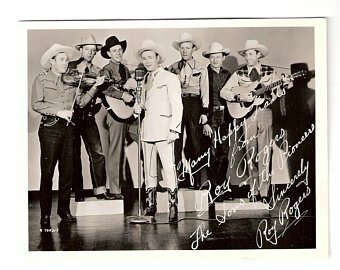 Photo at top of page: Left to Right: Tim Spencer, Bob Nolan, Hugh Farr, Roy Rogers (Gus Mack, announcer). True West Magazine voted the Sons of the Pioneers the “Best of the West” in 2015 and 2016. True West is the world’s oldest continuously published Western American magazine, founded in 1953. It is dedicated to relating American Old West history back to the present day to show the role contemporary Western heritage plays in keeping the spirit of the Old West alive today. The Golden Boot Awards honor actors, actresses and crew members who have made significant contributions to the genre of Western television and movies. The award is sponsored and presented by Motion Picture and Television Fund, a charity organization of the film and television industry. Foundation members of the Fund include Steven Spielberg, Kevin Spacey, Michael Douglas, Samuel Goldwyn, Jr. and other Hollywood celebrities. In 2003, the Sons of the Pioneers received their Golden Boot Award at the 21st Annual Awards ceremony in Hollywood, California. Other recipients that year included Tommy Lee Jones and Kris Kristofferson. The Pioneers performed songs that were included in several John Ford western movies and that have appeared on The Roy Rogers television series on ABC. The Texas Trail of Fame is a non-profit dedicated to honoring individuals who have made a significant contribution to “our Western way of life and heritage.” In 2001 the foundation awarded the Sons of the Pioneers a star on their Walk of Fame in Fort Worth’s historic Stockyards District. The Sons of the Pioneers are Professional Members of the Western Music Association and were inducted into the Western Music Hall of Fame at the very first WMA Hall of Fame inductions in 1989. Even though the Sons of the Pioneers are not technically a Western Swing band, the Texas Western Swing Hall of Fame inducted the band in 1988 in recognition of their contribution across all styles of Western music. The Hall of Fame’s first inductee was Bob Wills, leader of the legendary swing band, Bob Wills & his Texas Playboys, and other members include such artists as Hank Thompson, Laura Lee McBride, Floyd Tilman, Eldon Shamblin, Hoyle Nix, and Asleep at the Wheel. The Country Music Association of Nashville, Tennessee elected the Sons of the Pioneers into its revered Hall of Fame in 1980,calling them “America’s premier western singing group.” Out of thousands of country western performers over the years only 133 individuals and groups (as of this writing) have been inducted into the Hall of Fame, which makes the Pioneers members of a very elite group of country music immortals. In 1979 the Smithsonian’s Division of Performing Arts recognized the Sons of the Pioneers’ contribution to American music and culture by officially designating the band a “National Treasure.” The Institution invited the band to perform a concert at the Museum of National History’s Baird Auditorium and presented them with a plaque recognizing the designation. The Sons of the Pioneers have been nominated for ACM awards 5 times, and 3 times have walked away with top honors. The band was first awarded the Top Vocal Group award in 1967. Then in 1977 the band won the coveted Cliffie Stone “Pioneer Award,” created to recognize those people who have made unique contributions to country music. (Other recipients of this award include Alabama, Johnny Cash, Charlie Daniels, Merle Haggard, George Jones, Brenda Lee, Loretta Lynn, Willie Nelson, The Oak Ridge Boys, Dolly Parton, Charlie Pride, Tex Ritter, Conway Twitty, Porter Wagoner, Hank Williams, Sr., and Bob Wills.) Finally, that same year the Academy presented the Pioneers with the Band of the Year (Touring) award. In 1976 the Hollywood California Chamber of Commerce chose to honor the Sons of the Pioneers with their own Star on the Hollywood Walk of Fame. The pink terrazzo five-pointed star rimmed with bronze and inlaid into a charcoal marble is located at 6845 Hollywood Boulevard. The Pioneers were chosen to acknowledge their celebrity status in the recording industry.